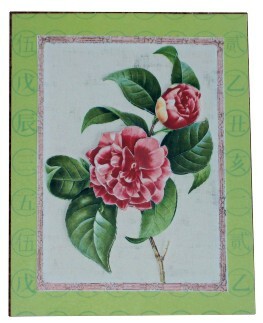 This 3D cutting of camelias has its own distressed background and a oriental style pink border. So I backed it with scrapbook paper with Kanji characters in repeating circles. The final result is very restful, so I'm calling it Zen. This strip of sunflowers (including the red band) were part of a 3D sheet I printed. 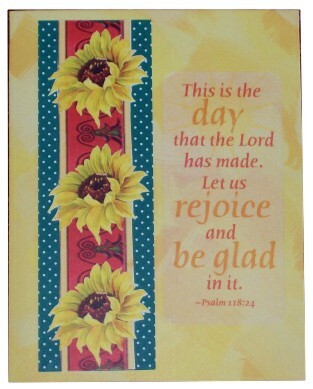 I mounted it on the green dotted scrapbook paper and then on a yellow scrapbook paper with a brush-stroke look. To finish it I added the vellum text sticker on the right. 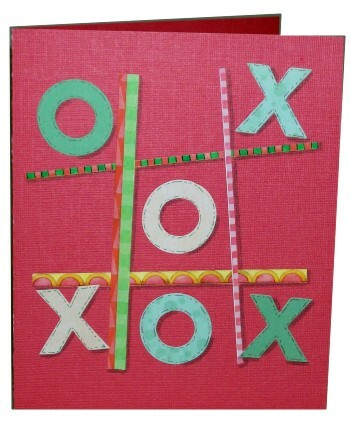 I turned the Xs and Os into a game of tic tac toe with sticker strips for the lines and punchout letters. I added dimensional broken lines around the letters in the opposite color to the letter (green on peach, raspberry on green). I used watercolor marker in grey to add a drop shadow to all the elements for some dimension. 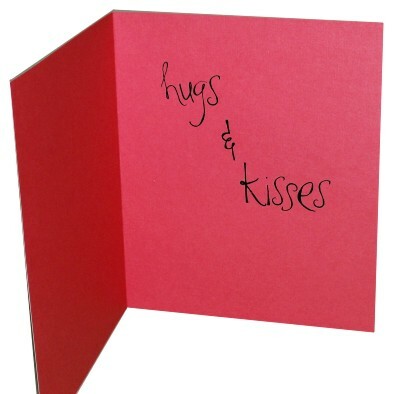 On the inside I went back to the 'expected' theme of the Xs and Os and added "hugs and kisses" using rub-on letters. White on white parchment work is my absolute favorite. This little dress is a free pattern I got online. 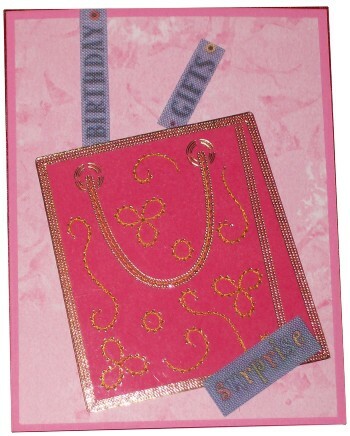 Since none of the embossing shows up if the liner is also white I added a pink one. One of the 3D sheets I printed came with this graphic which is NOT a 3D. So I clipped it out and mounted on two layers of scrapbook paper. I occastionally like to use an oblong card shape. I added a printed fabric sticker for the greeting. I wondered how I was going to work 'underwear' into a decent card. Then I found that I had these 'corset' peel-off stickers that were given to me in a swap. I mounted one on a blue glossy card and cut it out. 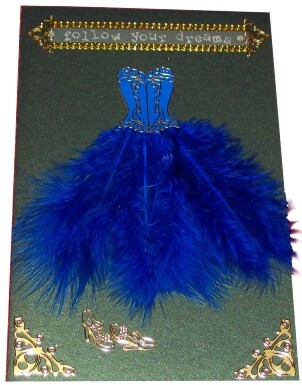 It is mounted with silicone on the card front and 4 blue feathers are tucked under and glued to form the skirt. Peel-offs and a fabric sticker are the finishing touches. I bought myself a little tool that heats up and has different attachments for the hot end. One of these is a disk for making transfers. I used my sewing machine to stitch the transfer piece to the card and pulled all loose ends to the front to tie a knot. This is the first time I have used a stencil like this. I taped it to the cardstock and used an old plastic card to apply dimensional paint and scrape it level. 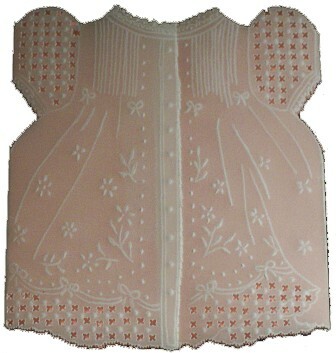 The stencil was removed immediately so the paint dried with soft edges. The paint was irridescent so I applied it to the card corners with a fingertip, then punched with a corner punch and a corner inset punch. The oval was cut out with my Coluzzle and a picture affixed before mounting on blue cardstock. 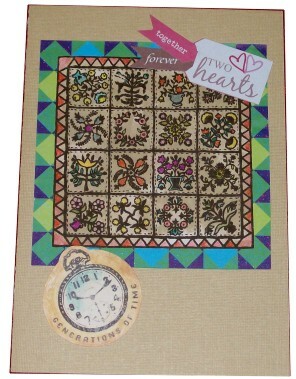 I stamped the little quilt using Adriondack in a brown tone. I colored it with colored pencils and it was a little too stark on the white cardstock. So I brayered Ranger's Distressing ink pad in "Old Paper" over the whole surface and cut it out. 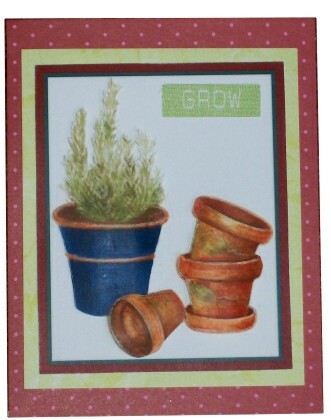 The colorful green/blue border is scrapbook paper. Mounting this on tan cardstock I then placed stickers at the top and bottom. 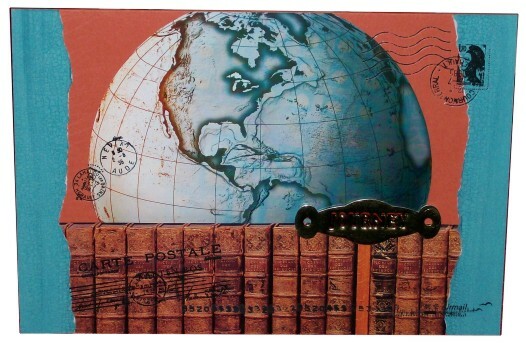 This quick card is made from two advertising elements (globe and books) on folded brown cardstock. Two strips of torn scrapbook paper frame the sides. Then I used some 'postal' rub-ons from 7gypsies. The label that looks like metal is actually foam-mounted plastic. It says "journey". I used a stitching sticker for the front of this card and the fabric text stickers give a hint as to what one might find inside. 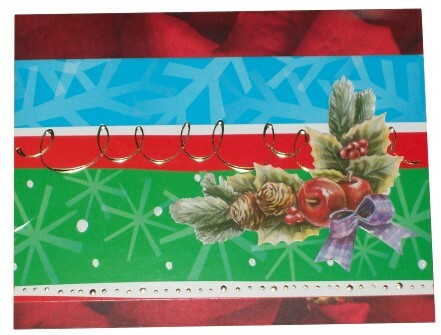 The center folder is stitched inside the card which is folded with a double wide spine. 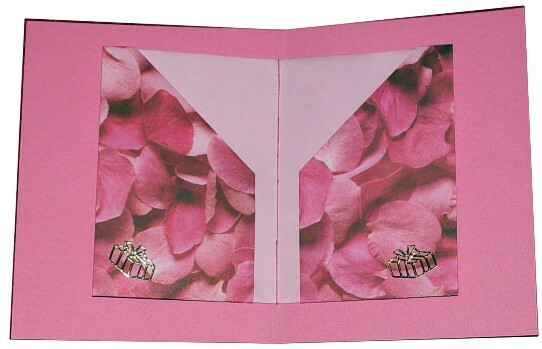 The folder is made from a single sheet of double-sided 12 x 12 scrapbook paper. 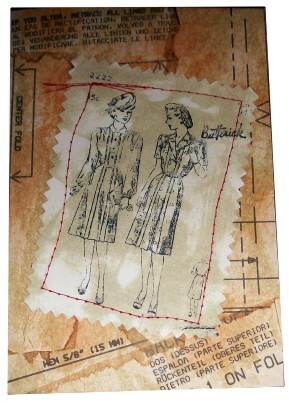 The folder instructions were gleaned from a Tim Holtz DVD. These are only two of the four pockets that the folder presents. 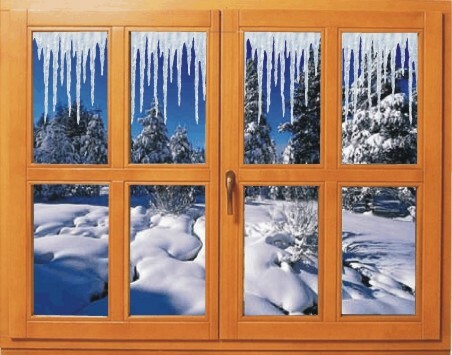 The intent would be to fill them with gift cards, lottery tickets, cash or anything else one might wish to present as a gift. Although you will recognize the diamond printed vellum from yesterday's napkin card, this card started with an oval tag. With the tag in hand I went around the studio, finding an item and adding it then looking for the next. When I work this way, without gathing all the elements first, I am as surprised by the outcome as anyone. This is the order in which I found and added elements: oval, ribbon roses, punched leaves, blue fabric flowers, gold flower centers, vellum, ribbon, outer brackets, inner brackets. I used my Xyron to apply a layer of adhesive to the already-folded card front. Then I applied just the top layer of a dinner napkin and trimmed it up. The image was just too bright so I found the light weight vellum with a very faint diamond print and cut it to fit. I ran this through the Xyron for adhesive and sealed directly to the surface of the napkin. I burnished it well to seal. 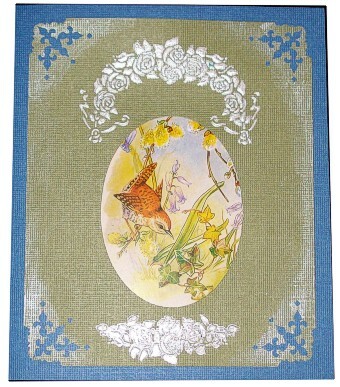 Because of the elegant and subdued feel of this card I make it a sympathy card with a peel-off. 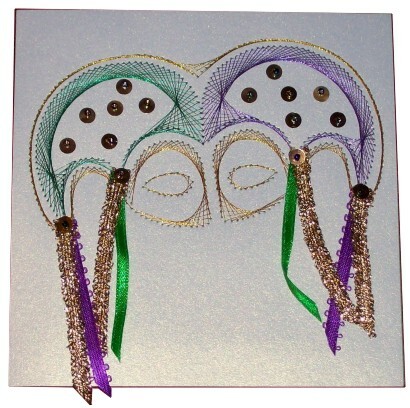 I had an idea to make a Mardi Gras mask and this is the result. I designed a stitching pattern using CorelDraw and stitched it out using metallic Sulky threads in green, purple and gold. I added sequins with green/purple beads and then stitched on coordinating ribbons with the same sequind and beads. Brown paper lace on a light rose paper sets the tone for this card. 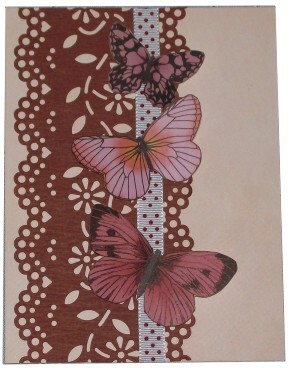 I added a cream ribbon with brown dots and three printed die-cut butterflies. The butterflies are mounted with the bodies glued down and the wings held aloft by silicone glue underneath. This illistration began as a French laundry soap ad on a collage sheet. 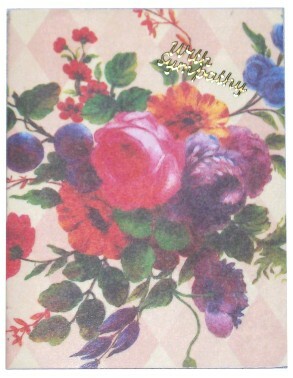 The off-center mat is really a moss green and is backed with a blue/gree/yellow striped scrapbook paper. 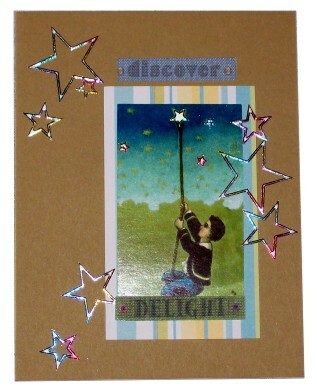 I added peel-off stars to mimic those in the graphic and then a few tiny ones in the boy's sky. The final touch was two fabric text stickers. 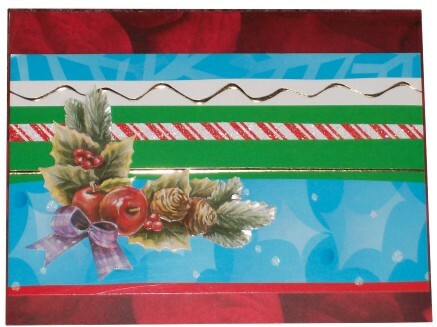 I cut apart an old Christmas card that had these great graphic bands printed on it. I mounted on a printed scrapbook paper and then Topped off with a 3D element. Today I decided to create some digital art. 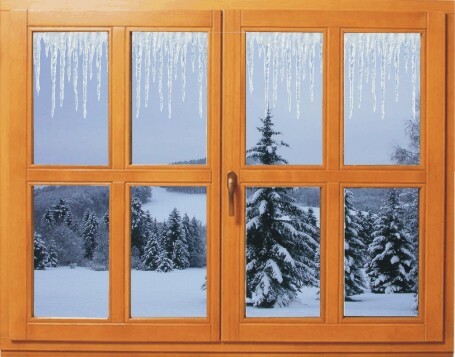 These window scenes are created in three layers: the winter scene, the icicles, and the window frame. I think the thrid one is my favorite. 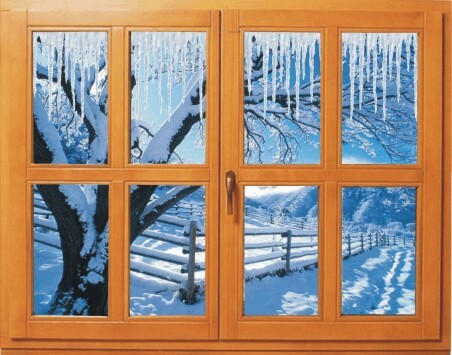 They will be printed directly onto cardstock, creased at the top of the window and trimmed to make cards. On this scene of pots and herbs I treated the plant a little differently. I used fine scissors and 'fringed' the edges of each branch of the stalks and 'fluffed' them with a fingertip. The stalks are then only glued at the center. It gives a nicer effect to the 3D scene. I also really curled the pots before gluing them down. They are glued with depth at their centers and flush at their edges. I added lots of layers to frame out the litle scene and added a fabric text sticker to the top corner. 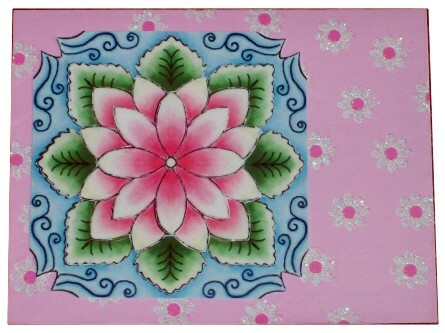 A glittery floral giftwrap serves as the background for a 3D medallion I downloaded online. The little pink-centered daisies really complement the centerpiece.